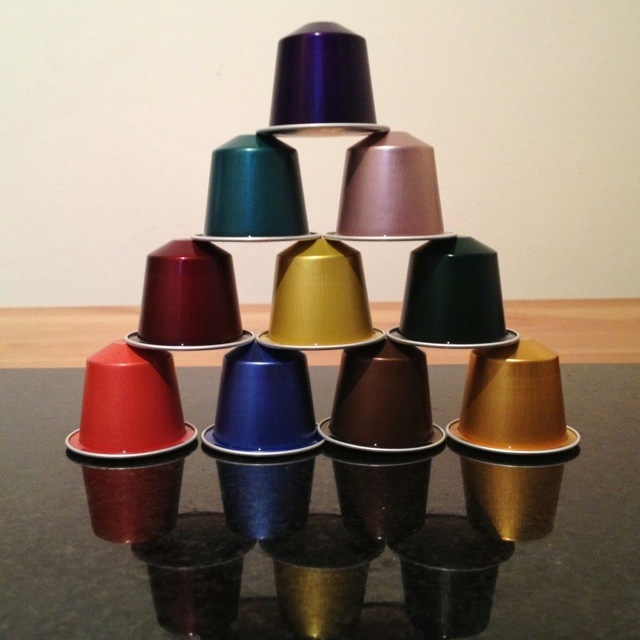 I was moaning on Tuesday – not least on Twitter – about my inability to make good coffee at home, and as a result, I’ve been given a Nespresso machine. These are some of the pods that go in it. It’s by far the poshest kitchen gadget I’ve ever owned. I rarely eat in restaurants with hardback menus, yet know I have one in my own home describing the 16 Nespresso “Grand Crus”…! The coffee is very tasty – but at 30-odd pence per cup, it isn’t cheap! This 1,786th post was filed under: Photo-a-day 2012.